It took place during the radiation phase of my breast cancer treatments. My radiation sessions were scheduled at the same time, every day, for six weeks. Each day I saw the same patients and the same technicians. We were all on a first name basis. I saw the same hot chocolate-cappuccino-coffee machine, the same cheap plastic bowl of fresh apples, oranges and bananas, the same stack of well-worn out-of-date magazines, the same relatives and friends accompanying their loved ones, and the same zapping of radiation. The one thing that didn’t stay the same was our changing bodies. We were all deteriorating. Not only was my body changing from the radiation but also the deep chemically-induced menopause I was in, was severely affecting my quality of life. If you can imagine how regular menopause affects women who lose their hormones gradually over a period of years, just think how it felt to lose mine in two weeks. I was having extreme hot flashes every ten minutes, twenty-four hours a day, seven days a week, some so harsh they left me faint. Menopause can also create a depressed feeling and I felt that creeping in as well. My doctor told me that losing my hormones so fast due to chemotherapy was doing such a job on my body, it was like driving my car into a brick wall at forty miles an hour. I found his analogy validating because that’s exactly how it felt. Smash! Bang! Boom! Just to let you know, radiation in itself is actually quite painless. Unfortunately, what happens as time wears on is the skin that’s been radiated gets burned. Sometimes it looks like a fashionable tan, sometimes it looks like a sunburn, and sometimes the skin gets so badly burned, the doctors have no option but to stop the treatments completely. That’s exactly what happened to my friend Lily. Lily and I met in the radiation waiting room while she was being treated for breast cancer. She was of Asian decent, and even though she stumbled with her broken English, and I with my Chinese, we understood each other perfectly. Just like schoolgirls, we saved seats for each other every day. We connected on many levels and as the weeks moved along, we developed a deep love and respect for each other. One day Lily confided in me that she would no longer be coming for treatment. She opened up her shirt and I couldn’t believe my eyes. The severity of the burns on her chest was shocking. I didn’t know if Lily’s skin was more sensitive than mine or her level of radiation stronger. What I did know was that Lily’s chest couldn’t tolerate any more and her treatments were stopped permanently. I felt terrible for the hopelessness of her situation and, selfishly, I also felt terrible for myself — I would miss her. I made several attempts to stay in touch, but sadly Lily and I never saw each other again. That’s not the story I want to tell you. Another patient I met while sitting in the waiting room, day after day, was Peter. He had prostate cancer and we soon became buddies. Peter’s treatments were affecting his hormone levels, similar in ways to mine. He was going through a male menopause of sorts, complete with hot flashes, weight gain, frequent bouts of crying, periods of insomnia, low libido and an overall lack of well-being. He often shared his emotional and physiological changes with me in great detail because he knew I would understand. Peter and I developed quite a bond, playing pranks on each other regularly. Each afternoon, while waiting for his name to be called, he ate a banana from the fruit bowl. Peter just loved bananas. One day, he was late for his treatment and I noticed that there was only one banana left in the bowl. I didn’t want anyone to grab it, so being the thoughtful prankster that I am, I snatched up that Chiquita and hid it in my pocket. When Peter finally arrived, he ran over to the fruit bowl but alas — no banana. His disappointment was palpable. “I wanted a banana but there’s none left,” he answered. “Awww…that’s too bad. Well, look down here. Oh my goodness. Is this a banana in my pocket or am I just happy to see ya?” Quickly I whipped out that banana and Peter’s face lit up. What a sight. To most people, this may have seemed like such a small thing, but those kinds of exchanges amused us to no end and it helped get us through the day. “Are you ready, Marla?” the voice on the intercom would ask. Talk about a contradiction. Then the radiation machine would let out a disturbing sound that alternated between a high-pitched squealing noise and a machine gun popping. In a minute or two it would be all over, only to be repeated several more times on other areas of my chest. Sounds pretty simple doesn’t it. They’d do their job by zapping me and I’d do mine by lying still and taking in the rays. Each day was becoming harder than the next. I started to feel like I had nothing important to do. In order to bring in some money and keep myself somewhat active and stimulated, I got myself a part-time job at the only place that would hire me, Tusquellas’ Fresh Fish Market. Can you imagine feeling nauseous and choosing to work in a FRESH FISH MARKET? What was I thinking? Talk about upsetting aromas!!! On the plus side, when I went into a huge hot flash, I’d just leave the customer in the middle of their order and jump into the walk-in freezer at the back to cool off. Sometimes I’d come out with icicles hanging off my hair. I’m not kidding. That’s not the story I want to tell you either. One day, while sitting on the cold slab in the radiation chamber, Andrew, my technician-du-jour, asked me how I was doing. Maybe he was expecting me to say the usual ‘I’m fine thanks and you?’ but I didn’t — not that day. "Well, I’ll tell you what I see, Marla. The other day we had a new patient. Remember? She came in with her husband, the one with the blue scarf on her head. Well, as you know, we have to take a Polaroid picture of each new patient for our records, so that we can make sure we’re giving the right radiation to the right person. Anyway, you and Peter were sitting together, chatting away as per usual. Then we came into the waiting room to take that woman’s picture, but she refused to let us and started to cry. I was shocked by what Andrew had told me. I was more shocked by his total recall. After Andrew left the room, I sat there absorbing all that he had said. He made me feel better. He gave me a new perspective on things. You see…he took the time for me, to point out that I took the time for someone else. It was only one moment out of our lives, one moment in time, but it gave so much and sometimes that’s all it takes to help each other get through to the next day and the day after that. Sometimes, it’s just that simple. That’s the story I want to tell you. Previously published in the International Journal of User-Driven Healthcare and Cell2Soul. Marla Lukofsky is a Canadian/American veteran stand-up comedian, writer, breast cancer survivor and keynote speaker. Her voice can be heard as Good Luck Bear on The Carebear Cartoon TV series. Her writings have been published in various medical journals in North America including Cell2Soul: The Journal of Humane Medicine and the Medical Humanities, The International Journal of User-Driven Healthcare (IJUDH) as well as The Online Journal of Community and Person-Centered Dermatology (OJCPCD). Ms. Lukofsky shares her unique journey with cancer and life in the highly acclaimed show ‘I’m Still Here…and so is my Hair!’ to audiences across the Globe. She has also written her memoir by the same title. Marla’s belief is that if she can touch even one person and have them feel they are not alone, then she has succeeded. I am an artist based in the San Francisco Bay Area who specializes in the intersection of art and science. I focus on brain scans, particularly MRIs, because I consider them one of the primary symbols of Multiple Sclerosis. Since my diagnosis of MS, I have continually undergone brain scans to track the progression of my disease. Initially the sterile black and white images of the MRIs of my brain were terrifying, and I refused to look at them. I began using my art practice to reinterpret these frightening yet mesmerizing images. I seek to disrupt the unsightliness of these digital images, inviting the viewers to stare directly at the beauty and complexity of the imperfect brain. My diagnosis has allowed me to integrate neurotechnology into my artwork. 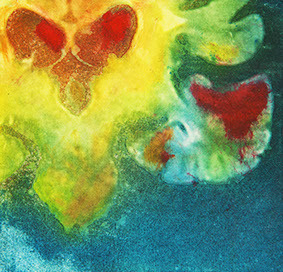 Through printmaking, mixed media, and textiles I transform my scan into vibrant landscapes in hopes of challenging how society views illness. I create with the intent of transforming how people view the imperfect body, allowing room for celebration, curiosity, and fascination. My artwork has been displayed in permanent collection at various institutions, universities, and hospitals throughout the country. My heart remains rooted in the narrative of illness. I am now trying my hand at art and design in the clinical setting. I have been inspired by the power artwork can have to broaden and deepen the narrative around chronic illness. This is the core of my mission, to create artwork that encourages social engagement and spurs conversations. My vision for several upcoming projects combines patient—centered design strategies, evocative artwork, and powerful narratives. I am currently exploring how art, storytelling and technology can be used to revolutionize the untapped potential of time spent in waiting rooms of clinics. At some point in our lives, we all become patients and are challenged with accepting illness as a part of being human. Chronic disease is an ongoing natural disaster of the body, where the tsunami is a never-ending undulation of change. This disaster leaves in its wake a real sense of fear, isolation and heightened awareness of the fragility of one's body. Many illnesses that are depicted in the media have a narrative that has a beginning, middle and end—a flowing arc to the story. But most illnesses, especially those that are chronic, lack an arc or even a narrative that makes sense to the outsider. Sometimes it can feel overwhelming, lonely, or diminishing. I create with the intent to transform this experience and use a medium that fosters connections and conversation. In doing so I aim to open up people’s eyes to see the unique perspectives gained through living with disease.